Merrill’s Shell Bank lies a few miles due south of Pass Christian, at the “Tail of the Square Handkerchief Shoal.” Buoys were used to guide vessels through the pass after 1829. 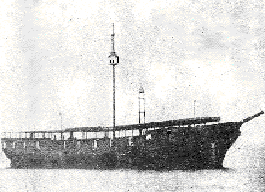 In 1847, America’s first iron-hulled lightship was anchored there to mark Pass Marianne, named for Marianne l’Adnier, wife of Nicholas l’Adnier (Ladner), the name sake of Pass Christian. The ship was painted black and had a raised deck canopy above the main deck. The 364 ton vessel was known as the Revenue Cutter Legare, having seen action in the Mexican War before being retired. At the opening of the Civil War, the Confederates seized it for conversion to a Gunboat and it sank one Union boat. It was later sunk by the Confederates supposedly off Henderson Point near the railroad bridge crossing the Bay of St. Louis. Screwpile technology caused the termination of the expensive rusting lightship. The Light-House Board requested Congress to replace it with a more-maintainable screwpile lighthouse in 1857, but funds were withheld. Undaunted, in 1859, the Board offered conclusive proof that most shallow-water lightship stations could be replaced with screwpile lighthouses. Given broad authority, the Board retired or relocated every lightship in the Gulf. 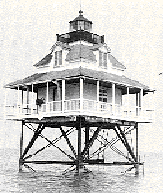 The 5-pile station was built at Merrill’s Shell bank – designed as a typical square wood dwelling surmounted by an iron lantern. 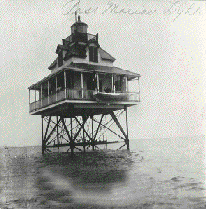 It was completed and lit on August 10, 1860, with a lantern that was 45 feet above sea level and which sat above the lighthouse keeper’s wooden dwelling. 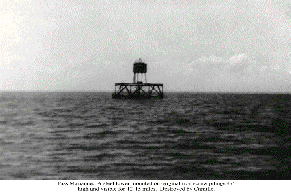 It was also equipped with a large hand-struck bell that served as one of only two fog signals on the Gulf Coast east of Galveston, Texas. Keeper James Carver and his assistant, “French Charley,” served until Confederate authorities removed the fourth-order lens in July 1861, and stored it at Bay St. Louis. This altercation resulted in a pistol duel that took place in the wooded area behind the Pass Christian Hotel. Unbeknown to either antagonist, their seconds contrived not to load shot balls in their pistols. Thus, they shot at each other with paper wadding. Charley’s shot drew a spot of blood as it grazed Arnold’s cheek. Still filled with blood-lust, he demanded another shot. However, as he watched the loading process, his murderous intent turned to a fit of trembles. He therefore declared his preference for a shot of whiskey than a shot of cold lead and treated everyone to a round of drinks. The U.S. lighthouse engineer found the station in quite good condition in 1862, so a temporary sixth-order lens was installed on November 19, 1862, at the urging of General Benjamin Butler. In May 1863, Keeper James Burroughs was arrested for supplying the enemy with almost a quarter ton of contraband bacon that he had hidden in the lighthouse. His assistant keeper was also fired for drunkenness. The original fourth-order lens was captured at Bay St. Louis in March 1863, – due to heavy sea traffic it was repaired and replaced in 1866. Sometime after the Civil War, Henry Theodore Koerner took over as light keeper. The German immigrant had jumped ship in New Orleans after a drunken captain stabbed a fork into Koerner’s back for serving cold food while he was a young cabin-boy. Koerner married German-born, Mary Magdalena Heiderhoff and they homesteaded in Bayou LaCroix area, north of Bay St. Louis. In the early 1870s, while working on the L&N RR bridge crossing Bay St. Louis he became aware of an opening as lighthouse keeper for the Pass Marianne lighthouse, officially known as Merrill's Shell Beach lighthouse. Koerner gladly moved with his wife, Mary, and children to the lighthouse, but unfortunately, the lighthouse had been freshly whitewashed with white lead paint. The entire family became affected by zinc poisoning, falling into semi-comas and the loss of hair, eyebrows, and eyelashes. However, even before the poisoning took its full effect, the youngest child, Hattie, had drowned while at the lighthouse. 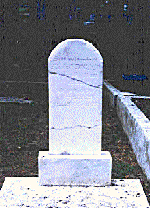 Her frail 2½-year-old body washed ashore near the Pass Christian College in August 1875, now the site of present day Miramar Nursing Lodge. At Pass Christian, behind the Episcopal Church is Live Oak Cemetery. There is something about its appearance – the occasional massive Celtic cross, the carefully tended, symmetrically laid-out family plots, the Anglo-Saxon names -- Henderson, Hancock, Williams, and so on -- which immediately stamps it as a bit of transplanted England. This is one of the most beautiful and picturesque burial places along the Mississippi Gulf Coast. drowned at Merrill's Shell Bank Lighthouse on 22 Aug. 1875"
Keeper Koerner returned to the mainland, and another keeper stepped into his place. In June 1880, the building’s shake roof caught fire from stovepipe sparks, but replacing the burned portions with more wood failed to solve the problem. On September 6, 1883, the entire station burned to the screwpiles. In quick response, it took only 44 days to completely rebuild the superstructure for lighting on November 20. The new station was roofed with fireproof slate. This reconstructed lighthouse survived the severe hurricanes of 1893 and 1906, with only superficial damage. In 1893, waves had washed over the gallery surrounding the dwelling, 15 feet above normal tides. The lighthouse was automated in 1932, and discontinued in 1945, followed by demolition of the two-story Victorian-styled keeper’s home The site is now called the Square Handkerchief Shoal Light – mounted on a small steel skeleton tower atop the original wooden piles.